But back to Syria. It’s complicated. Really complicated. And to add to the mix, there are a lot of big international players in this game and they all have their own agendas. And the pursuit of these agendas are costing lots and lots of lives. The prize that these players are looking at is who gets to run post-Assad Syria (or whatever takes its place) and they all want to make sure that it suits them. Of course, in the long term Assad’s finished. He can hold out for a long time (maybe years) and kill a lot of people in order to hang on to his position but the scale of the rebellion against him means that, sooner or later, he’s going to go. As a gesture of reform the regime may even ditch Assad and replace him with a “moderate” figure, but as so much blood has been spilled that is probably not going to work as a long term solution. But for Syria the real question is how much carnage will be caused by the continuing war, what forces will be unleashed by this horror that will traumatise and haunt the population for decades to come and whether it will be possible to have some sort of functioning society in the future. I fear that Syria is on a downward spiral for many years to come. Bashar al-Assad wasn’t supposed to be in charge of Syria – he was handed the job of dictator from his father Hafez al-Assad, who grabbed power in a military coup during the 1970s (Bashar’s older brother Bassel had been groomed for the job but he was killed in a car crash while rushing to the airport in the 1990s). Syria was yet another construction of Imperial meddling in the aftermath of the post-First World War carve up of the Ottoman Empire with an arbitrarily drawn national entity being placed in the French sphere of influence. After decolonization there was an attempt to create a Pan-Arab super-state under the Arab Socialist Ba’ath Party in the 1960s, of which Egypt, Iraq and Syria were the three big players (that’s why their black-white-red tricolour flags all look so similar). Now the Ba’ath’s idea was to create a modern, progressive state guided by moderate Islamic values and principles (which actually made them violently opposed to all forms of Islamic fundamentalism). All fine in theory, but building utopia is usually accompanied by purges, executions of opponents, and widespread terror to enforce social change. Anyway, three strong-men with egos all vying to be the one in charge of the new unified Arab state was not going to work out well. Although the three countries joined forces to attack Israel in 1973 and almost succeeded in their attempt (leading to increased Israeli interest in nukes) the idea of a single Arab state quickly fell apart. 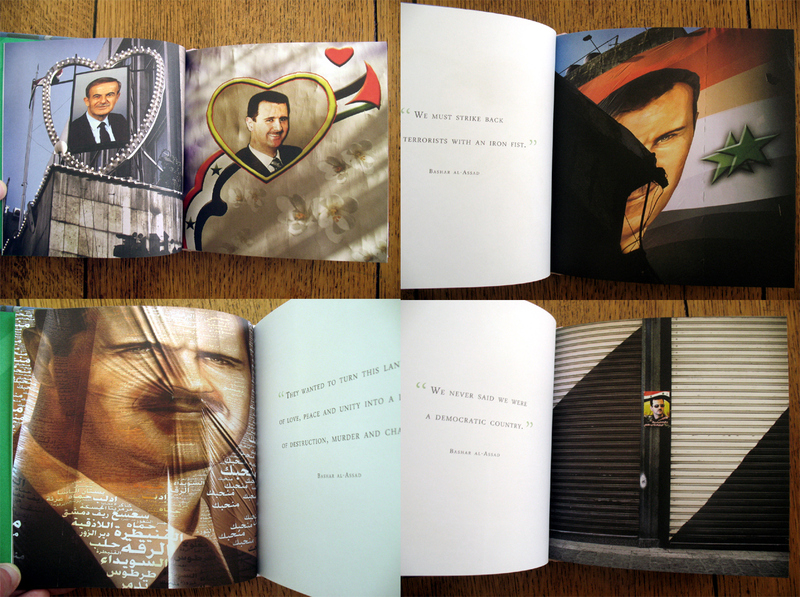 A small publication by Trolley Books in 2012, Yes to A Rosy Future consists of square images of Assad’s posters combined with slogans and quotes from his speeches that subverts the regime’s propaganda through exposing the hollowness that lies behind the icon of power. 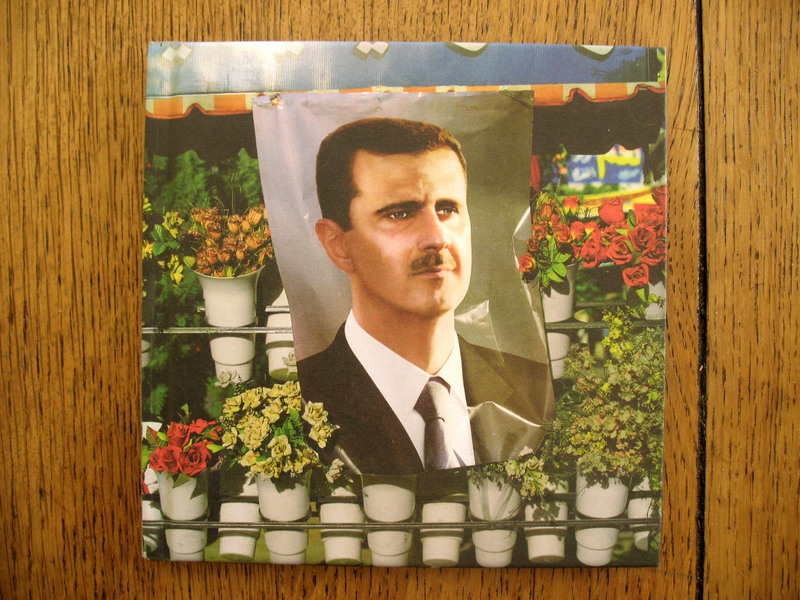 Like many other similar regimes in the region, Assad’s image is everywhere. But unlike Saddam who liked to play dress-up and was depicted in everything from traditional Arab costume to military supremo, Assad is shown mainly in sober business suits that make him look like a fairly dull, unimaginative middle-manager. He looks like a safe pair of hands. Grand visions for the future and rabble rousing are not his thing. He certainly doesn’t exude any of the charisma associated with dictators (no doubt his speech impediment, inheriting the family job and being a spare part for most of his life have defined his position.) So what is the purpose of all this imagery? 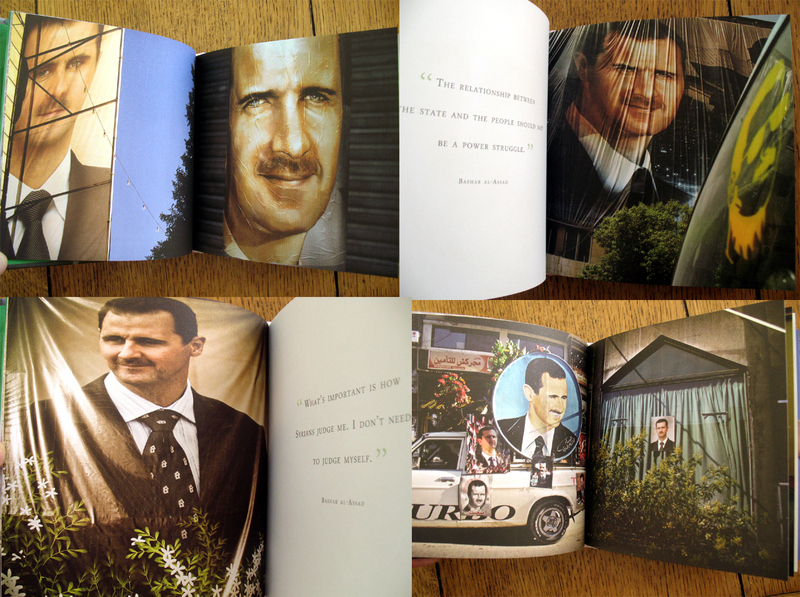 Well, Righetti made these photographs during the last election campaign in 2007 when, in theory, Assad was returned with 97% of the vote as president (the title of the book comes from one of the slogans used in the election campaign.) But of course, such elections in a dictatorship are utterly without meaning but they do serve as a way to force people to demonstrate their active loyalty and support for the regime in a manner reminiscent of a medieval serf paying homage to the ironclad gangster who demands obsequious public devotion in order to validate his claim to be lord of the realm. But from the scale and ferocity of the violence, we can see that this apparent display of loyalty was a sham, devoid of all meaning for substantial parts of the population. However in a totalitarian state where the secret police are constantly watching for signs of dissent and disloyalty a strange game is played with icons of the glorious leader. Within an insecure and paranoid regime, any sign of dissent becomes a threat. For the regime, enemies are everywhere. Arrests are made to produce fear and maintain control over the population. Thus, in this climate of fear, the image of the leader starts to appear everywhere. He becomes a religious icon whose purpose is to ward off evil spirits in the form of the authorities. Think about it; if everybody else has pictures of the leader plastered over their houses then by not doing the same you are asking for trouble. A one-way ticket to a jail cell and torture would probably be the result for your outward display of non-conformity. By not putting up the picture of leader you are in effect refusing to go along with the idea that he is the divine ruler of the magic kingdom in which you live. So as a means of self-preservation the portrait of the leader becomes a talisman that people hide behind in a dictatorship. But it doesn’t end there; it creates a self-reinforcing cycle of ever increasing demonstrations of loyalty as people begin to display the icon everywhere at home and in public because to do otherwise could be regarded as a sign of you not being 100% committed. But of course this outward display usually hides the fact that whatever initial popular support might have been held at the beginning of their rule has collapsed over time (usually endemic corruption quickly erodes the initial ideals of the revolution) until it is reduced to meaningless slogans as paranoia and fear consume everything. This can be seen Righetti’s image of a bored looking man holding up a poster, demonstrating the utter farce this ritual of public adoration has been reduced to. 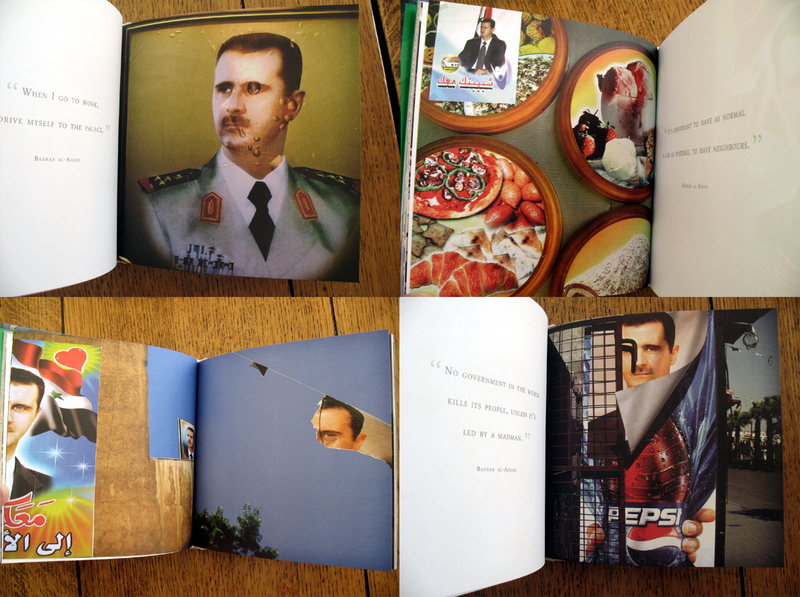 Assad’s portrait, large and small, consumes both public and private spaces from huge billboards to small posters and stickers on menus and shop shelves, apparently showing his complete dominance of the public and private realm. 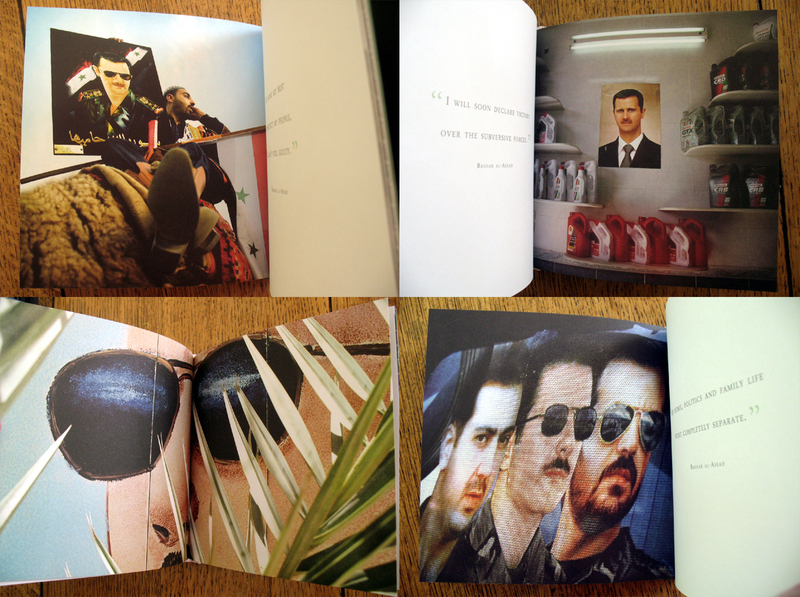 But the presence of Pepsi and mobile phone ads alongside images of the leader show that his monopoly of power has been undermined by the outside world, whose enticing images of an apparently glamorous lifestyle provide a threat to the control the totalitarian regime exercises over its people. The bubbles and creases in the images puncture the idealised facade presented by the regime. 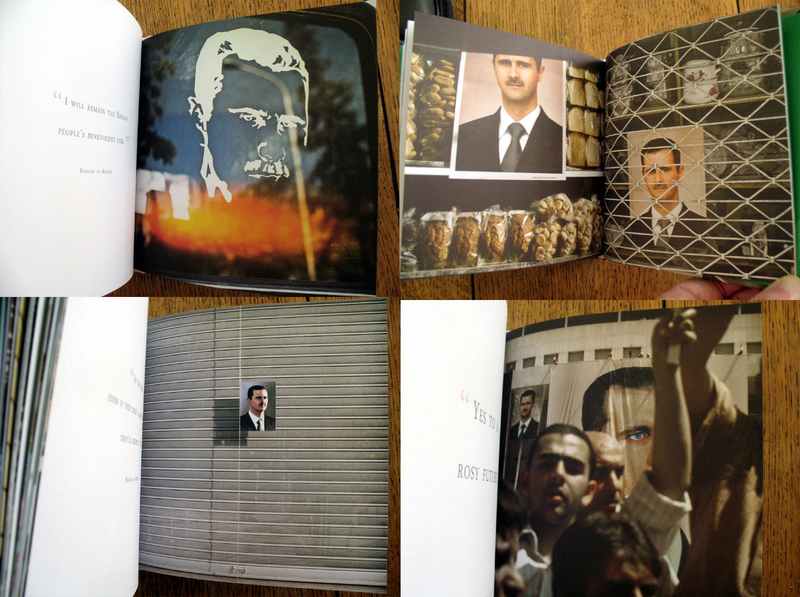 Similarly, adopting an Orwellian metaphor, Righetti repeatedly uses the Big Brother motif of Assad’s eye peering down, monitoring and watching his subjects, such as the image of the crowd scene. But, this eye of power is blind. It no longer has the power to intimidate or control. All it can do is look helplessly down as popular support turns into grudging conformity backed by the threat of violence, until that too collapses.